A second progress meeting hosted by the RPCL’s Cycle Track Committee on Thursday evening February 9, 2017 at The Woman’s Club of Roland Park was well attended by approximately 75 residents. During his welcome, Ian MacFarlane Civic League President shared news that Alta Design was recently retained to supplement the Committee’s work evaluating Roland Avenue’s cycle track and considering next steps. Presentations included Frequently Asked Questions (FAQs), Survey Results, and a Pro/Con analysis of options; these are now posted on the committee’s webpage at www.rolandpark.org. In addition, there was a discussion of Parking Enforcement. It was announced that the City’s 6 month review has been delayed and is now expected to be complete in June, 2017. The committee plans to conclude it’s efforts and submit a recommendation to the RPCL Board prior to the Annual Meeting in May, 2017 which has yet to be scheduled. Until then updates will continue monthly at the RPCL Board Meetings and your comments may still be emailed to the committee at cycletrack@rolandpark.org. The Roland Park community lost a great neighbor and friend this week with the passing of Al Copp. Dr. Phil Spevak, former president of the Roland Park Civic League, has prepared this remembrance. “Al Copp will be remembered by many, but all may not understand the difference he made to Roland Park. He embodied great personal qualities of integrity, fairness and responsibility but most importantly, he understood that in life, there is more value in helping others than in helping ourselves. He lived that philosophy. We became friends when, as a volunteer, he worked hard to help implement many of the major projects of our community master plan. He did so selflessly, never wishing to bring attention to himself. No one had a bigger heart. He joined our community efforts during his retirement. His integrity and his expertise, gained over a long career that included the development of the Inner Harbor, were valuable as we navigated sometimes-complicated city processes. Throw in humor, patience and perspective, Al added much. The following notice appeared in the Baltimore Sun on February 3rd. For those who have paid their Civic League dues and their full maintenance fees, an organic debris removal program is available. Roland Park organic debris collection is planned for the months of March, April, May, June, July, September, October and November and will be collected during the first two weeks of the month. Please visit the Organic Debris Pickup page for the requirements of the program and a link to the sign-up form. We are currently accepting applications for the pickup in early March 2017. Following is the text of a letter sent by Ian Macfarlane, President of the Roland Park Civic League, to the members of our state legislative delegation. For Roland Park residents who are interested in this issue and wish to contact the state legislative delegation members, follow the links on each representative’s name for mailing addresses, email addresses, and phone numbers. I am writing on behalf of the Roland Park Civic League and the residents of the Roland Park community to express our concern about the high utilization of Baltimore City Police Officers responding to accidents and other traffic incidents that occur on the Jones Falls Expressway (I-83). The responsibility for the stretch of I-83 from the City/County line to President Street currently falls on the Baltimore City Police Department (BCPD) and specifically on the BCPD resources of the Northern and Central Districts. With the severe shortage of police officers in Baltimore City, we feel that there is an urgent need to get the Maryland State Police to take over responsibility for this stretch of I-83. They already patrol the section in Baltimore County and they are especially trained for highway patrol. With accidents occurring daily, and sometimes more than once a day, the burden on the BCPD has become overwhelming. In order to maintain the safety of officers, rescue personnel, and the public, it is often necessary to shut down the roadway in one direction. This requires a minimum of three police cars that must be diverted from neighborhood patrol duties for periods sometimes stretching to as much as two hours. The patrolling of, and response to, communities on both sides of the highway are seriously impacted by these frequent events. In the past, it appears that jurisdictional issues interfered with the role of the Maryland State Police in Baltimore City, but now there are protocols in place for cooperation and the Jones Falls is a very discrete highway that can be managed as a discrete unit. In addition, this is a roadway that carries traffic from throughout the region. Most of the drivers are not from Baltimore City; they are work commuters, or travelling to and from sporting events. Easing the burden of policing I-83 from the City/County line to President Street would enhance BCPD’s ability to patrol the neighborhoods on both sides of I-83 in the Northern and Central Districts. With Maryland State Police enforcement, we might also see a decrease in the excessive speeds and a reduction in accidents. We need your help to make this happen. We recognize that the State Police are not going to volunteer to do this, so it is going to take some work on the part of the State legislative delegation – but we believe that it needs to happen, and soon. We hope that you agree that this makes sense and we ask for your support to find creative ways to make this happen. This story appeared in the Winter 2016 edition of the Roland Park News. RPCF Increases Leadership Role in Roland Water Tower Restoration. The Roland Park Community Foundation (RPCF) has recently increased its leadership role in the restoration of the Roland Water Tower to help move the project forward. The Board voted to oversee the construction of the project and hired a construction manager whose experience includes the Project Manager of the reconstruction of the Washington Monument in Mount Vernon. 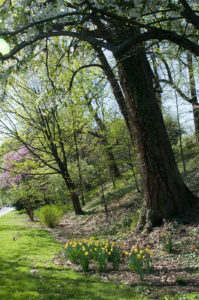 The 2010 Greater Roland Park Master Plan identified the Tower’s restoration as one of the most urgent Open Space projects, and after years of working with the City, the RPCF felt the need to step up their role if it was ever to see the restoration completed. 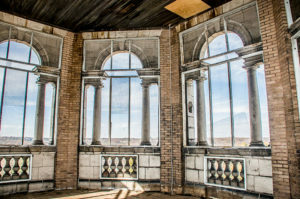 To recap the progress so far, in 2011, the RPCF, under the leadership of Ken Rice, secured a matching $2,500 grant from The Heritage Fund, a joint program sponsored by Preservation Maryland and the Maryland Historical Trust, to perform a structural analysis of the Tower. The Friends of the Water Tower donated $250 to the $2,250 provided by the Foundation. The study determined that the structure was essentially sound and that the Tower could be restored. In the fall of 2011, the 41st and 42nd Legislative teams in Annapolis came to the community and proposed the initiation of a Bond Bill in the 2012 Session toward the restoration of the Tower, subject to the community’s willingness to match the Bond Bill. The RPCF voted to pledge the funds to match the Bond Bill. Matthew Fitzsimmons and Elisabeth Sachs, two individuals on the leadership team, went down to Annapolis to testify on behalf of the Bond Bill and the City was awarded $250,000 toward the restoration of the Tower. In October 2012, the RPCF spent $37,000 to remove decades of dirt and debris inside the Tower. Workers in hazard material suits swept, scrubbed and secured the building with screens to preventing birds from returning. This first step in the restoration process allowed contractors and architects to gain safe access to the building. Due to its original function, the Roland Water Tower still fell under the auspices of the Department of Public Works (DPW), although City monuments are usually the responsibility of the Department of General Services (DGS). DGS said they were willing to have the Roland Water Tower transferred to them, but only if it came with some funding. The DPW team agreed to transfer the funds set aside to demolish the Tower, referred to as “virtual demolition funds,” over to DGS. This transfer process took many months and persistent phone calls from RPCF board member Al Copp, but it was finally completed on March 27, 2013. The Board of Estimates approved the transfer of $337,000 from the Department of Public Works to the Department of General Services for the restoration of the Tower, subject to a management agreement. With the transfer in place, the project’s design phase could now begin. Three project stages were identified: Phase One, stabilizing and restoring the Tower; Phase Two, internal access to the top of the Tower; and finally, Phase Three, the creation of a pocket park at the base. It is here that the project stalled. The initial design estimates for Phase One proved far higher than anticipated and Baltimore City did not accept the proposal. In April 2014, the Mayor’s Office suggested that the RPCF take on the design process to speed the process and save money. The RPCF worked with two different firms but both of the proposals were rejected. The first design firm was uncomfortable with doing the design work for one entity and then the construction work would be performed for a different entity. They placed exceptional requirements on the RPCF and after checking with legal counsel, these were rejected. RPCF attempted to secure another acceptable design proposal, but ran into obstacles when the new design company requested scaffolding to complete the estimate. Scaffolding is one of the largest costs of this construction project but because the design was going to be paid for by the RPCF and not the City, the City would require the scaffolding be removed before it was erected again by the construction company. The costs associated with erecting and dismantling the scaffolding for both the design and the construction phases, which the RPCF, rather than the City, would have to absorb, were simply too high. After more than two years of delays, it was clear that a new approach was needed. In early 2016, the City applied to receive an extension to the 2012 Bond Bill that authorized $250,000 in matching funds for the renovation of the Roland Water Tower. This presented an opportunity to request an amendment to the Bill, changing the recipient of the funds from Baltimore City to the Roland Park Community Foundation. Both the City and the RPCF Board approved this switch, which would increase RPCF’s responsibility for the overall project management. At the RPCF’s March 2016 board meeting, a motion was made and approved to formally request the City to begin the transfer of the Roland Water Tower’s restoration to the Foundation. Later in the spring, members of the Roland Water Tower Committee met with City representatives, including Councilwomen Mary Pat Clarke, Sharon Green Middleton, and then-Deputy Mayor for Operations Khalil Zaied. An agreement was reached whereby the City would pay for the Phase One design estimate, thus enabling cost estimates to proceed. In July, the first draft of the design proposal put the estimated cost within the $837,000 available for the project. The RPCF also agreed to oversee the construction phase and create a Memorandum of Understanding (MOU) with the City to determine the full scope of Phase One and their various financial responsibilities. To prevent further delays, the RPCF has recently hired Tom McCracken of McCracken Consulting, LLC to work with the City on its behalf and act as Project Manager during the Tower’s restoration. Mr. McCracken, a Roland Park resident, represented the Mount Vernon Conservancy during the restoration of the 200-year-old Washington Monument in Mount Vernon and has considerable experience with historic restoration projects in Baltimore City. At present, Mr. McCracken is liaising with the City on the design contract with JMT, a multi-disciplined architectural and engineering company, to further refine the design proposal. During its 111-year history, the Roland Water Tower has performed several practical and symbolic functions for the surrounding neighborhoods. Once restored, with a pocket park at the base, this iconic structure will take on a new role as an attractive local landmark and welcoming green space. The RPCL takes the topic of public safety very seriously and is committed to working with our BCPD and the community to disseminate information and advocate for positive change. At Wednesday’s RPCL meeting, there was some discussion on education of the community, so we’ve added a new page to the Roland Park website that will be dedicated to public safety topics. To start with, we are posting a very informative memo from our Northern District Community Council President, Bill Miller. In the memo, Bill summarizes the most effective ways to communicate with BCPD and to get information about public safety issues affecting our community. We have also added a link to the ‘Northern District Safety Tips’ flyer that Major Gibson distributed at Oct. 7th community meeting. The flyer offers common sense approaches to crime prevention that we can all benefit from. We invite you to visit the new section of our website at https://rolandpark.org/community-resources/public-safety/. In the next two weeks, City Council is expected to finalize the first Zoning overhaul in 45 years, known as Transform Baltimore which will effect the entire city. For the past 5 years, RP Civic League has been actively involved in this process. Within the last month, Baltimore Country Club has seized this opportunity to request the highest density in residential zoning possible to maximize the economic value of their land, which may be at the expense of existing home values. Your participation and action is urgently needed now, please read the letter that follows from Civic League President, Ian McFarlane. This is a very important letter to residents about a threat to the character of Roland Park. The issue: whether a developer could put a subdivision on Baltimore Country Club (BCC) land that is more densely built than the rest of our historic neighborhood. The BCC has hired the experienced political lobbying team of Harris, Jones & Malone and is threatening litigation in an effort to win zoning that would allow well more than 100 homes on the open space that sweeps up from Falls Road to their clubhouse. They have timed their effort for the 11th hour of the city’s long effort to establish new zoning for all properties in Baltimore. Our elected representatives are feeling the pressure of these hired guns. We need you to contact your City Council representative – Councilwoman Sharon Green Middleton or Councilwoman Mary Pat Clarke – and ask for her continued support to protect our zoning. Please tell the City Council to stand with its Baltimore City constituents. Zoning lasts for generations. It is of the utmost importance that the zoning on the BCC land should reflect the actual homes and lots of the surrounding community. Currently, the BCC’s open space is surrounded by homes on lots from about 10,000 to 64,000 square feet. The average for these nearby lots is 22,000 square feet. The BCC wants their zoning to allow one house on every 9,000 square feet. There is not a single home surrounding the property that has such a small lot. With this zoning, if BCC were to sell the property to a developer, they would be able to construct well more than 100 houses on the 32-acre parcel. On behalf of the residents of Roland Park, the Civic League (RPCL) advocates that the BCC land be zoned R-1-C (21,780 sq. ft.) or R-1-D (14,420 sq. ft.). This would allow construction of roughlyhalf the number of houses on the land versus what BCC is proposing. It is true that most of Roland Park is currently zoned for one house on every 7,300 feet. But that zoning does not reflect the neighborhood’s actual construction. The average lot size for all of the homes west of Roland Avenue, not just the houses next to the country club, is 18,000 square feet. We are trying to preserve the integrity of the neighborhood, as it exists in reality. Our community conducted an open, transparent process to state our recommendations, as the Transform Baltimore process required. In 2010, 2011and 2013, the RPCL Land Use Committee wrote letters to the City’s Planning Department requesting numerous zoning changes concerning local schools, businesses, and the BCC land. Over the years, RPCL representatives have met with City officials to discuss the community’srecommendations, and have testified on the matter at two public hearings. City Councilwoman Middleton has been with the RPCL every step of the way. On Friday, September 23rd, BCC wrote a letter to its membership asking them to contact Councilwoman Middleton and urge her to change her mind. In the letter, there were many misunderstandings. But several statements stand out as so egregious the RPCL feels it is important to set the record straight. First, BCC says that the RPCL is reneging on a previous zoning deal. They say the RPCL agreed to let them have the 9,000-square-foot zoning. This is false. RPCL officials are unaware of any deal. We are a community organization that is governed by an elected board. Everything we do must be discussed and voted on. Our process is deliberate, transparent, and requires collective board action. Our board has never deliberated on any zoning issue regarding the BCC property other than the R1-C/D position articulated the letters referenced above. Second, BCC says the RPCL is trying to downzone and devalue their land so the neighborhood can purchase it. This is also false. No matter who owns the land, zoning to match the surrounding community is of utmost importance. There are more than 200 neighborhoods in Baltimore City, all working to protect the unique character of their communities. We are no different. Finally, BCC has told their members that the RPCLhas made one “low ball and convoluted offer which made absolutely no economic sense.” In fact, Roland Park has made seven offers to the BCC in 17 years, not one of which was accepted. 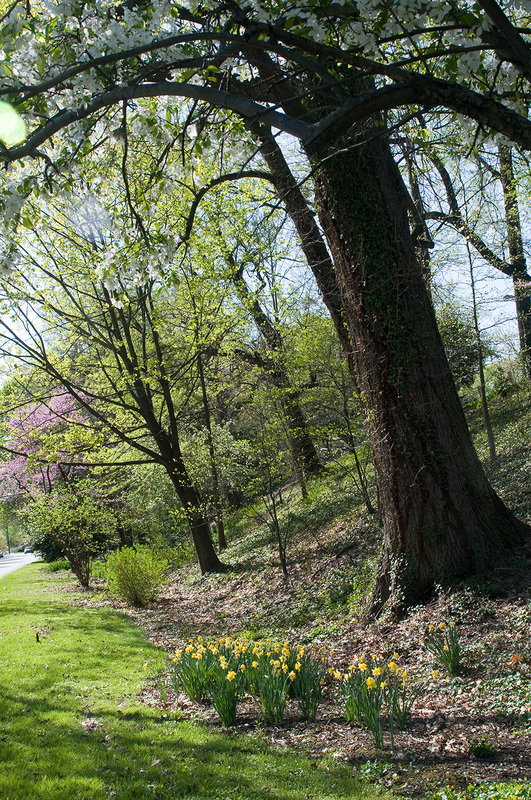 In 2015, the Roland Park Community Foundation hired an independent appraiser to establish the fair market value of the land, using the highest and best use of the land to determine price. An offer was then made at that price. It was rejected. 3. Remember that we are trying to preserve the integrity of our neighborhood. By voting for (on behalf of) the Roland Park community they are sending a strong message that City neighborhoods matter. Don’t wait. Please stop what you are doing, take 5 minutes and send an email or make a phone call. Neighborhoods Matter! The Roland Avenue Resurfacing project from Cold Spring Lane to Northern Parkway has been completed. This is the first parking-protected bike lane in Baltimore City, and the Baltimore City Department of Transportation (BCDOT) would like to alert residents of the new parking pattern on Roland Avenue. People in cars are advised to park in the parking lane next to the bike lane and not against the curb or in the striped buffer zone. The BCDOT has alerted parking enforcement that there will be a 2 week grace period of enforcement until October 1, 2016 for residents to adjust to the new parking arrangements. After October 1, 2016, cars parking in the bike lane or the buffer may be issued a citation. The below diagram illustrates where the parking lane is placed relative to the curb as well as examples of how to park properly. ALSO, a friendly reminder that the speed limit on Roland Avenue is 25 mph. Lower speeds makes our roads safer for everyone, especially pedestrians. We all want to arrive safely, so please be mindful to not exceed the 25mph speed limit. Parking enforcement supervisor, Yolanda Cason has clarified the amounts of parking tickets as: be $32 for parking in the buffer, $32-52 for parking in no stopping areas and $77 when parked in the cycle track lane. Please send requests for assistance with individual tickets to tickets@rolandpark.org. Police patrol cars will also be issuing speeding tickets per Major Gibson, Northern District. The City’s 6 month review is expected to be complete in early 2017. The Cycle Track Committee continues to meet monthly, collect data and interface with the City’s Department of Transportation staff. Plans are underway for a related community meeting to be held later this fall, details to follow soon.